I like to cook during weekends. It helps me rejuvenate and slow down my pace by self indulging in what I love doing. The aromatic flavours blending in my kitchen is like a therapy to my soul. Indian cooking, if managed well without over dosing of spices can be quite an indulgence. 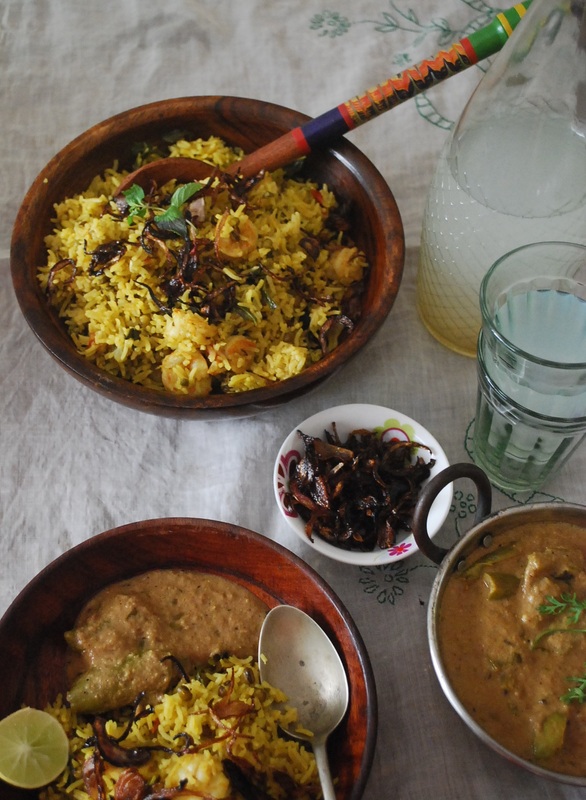 Pulav/ Pilaf is more like a special comfort food in Indian homes. It is usually made when one wants to eat something special or is bored of the same old mundane menu. Every household will have a special massala or spice mix that they use in this special rice preparation. I on the other hand, use only whole spice mix instead of commonly used powdered mix. I always like to flavour my pulav with heaps of fresh mint leaves which is cooked along with rice, meat/fish or veggies. Prawn pilaf is one of my favourite. I sometimes add peas for visual and taste. This time I twisted the recipe a little by adding in some sprouted mung. It didn’t change the taste but it did add some crunch to my dish along with fried onions. Did I tell you that I love fried onions in my pulav. It is not a traditional practice to add fried onions but hey who said you have to follow rules…. 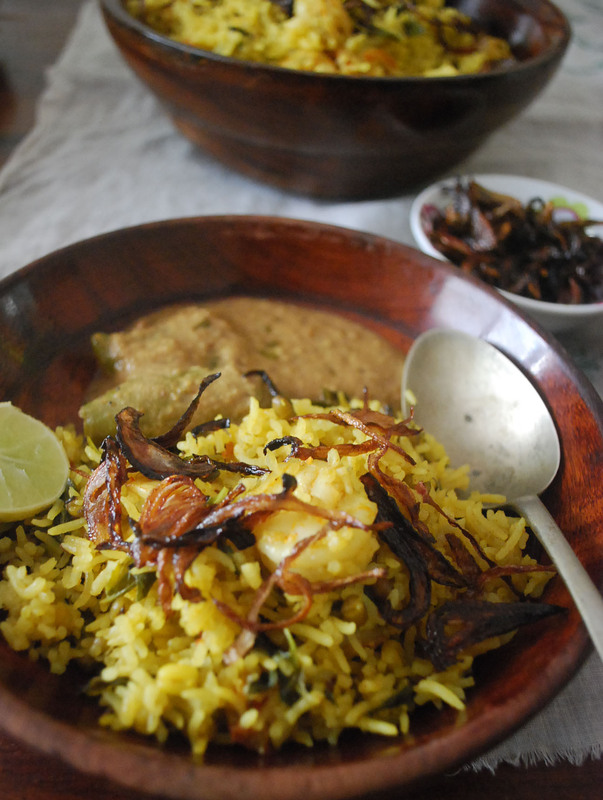 Heat oil/ghee in a rice (electric) cooker or a pressure cooker. Season with all the dry spices. Add ginger garlic paste, onions and cook until soft. Add tomatoes, prawns, mint and all the powdered spices and mix well. Add 1/2 cup of water and bring it to a light boil. Add rice, water and salt. Close the lid of the pressure cooker and allow it to cook. Turn off the heat after two whistles and allow it to sit for 15 minutes before serving. Transfer into a serving bowl or plate and garnish with some fried onions. Serve hot with raitha and mirchi ka salan. Serves 4.